My first home made French toast ever was a savoury one. Say whaaat!? As much as I love desserts and sweet stuff, savoury food always comes first (my recipe archive is witness to this thesis). So if you’re looking for a sweet French toast recipe you’ll have to look somewhere else (for now). 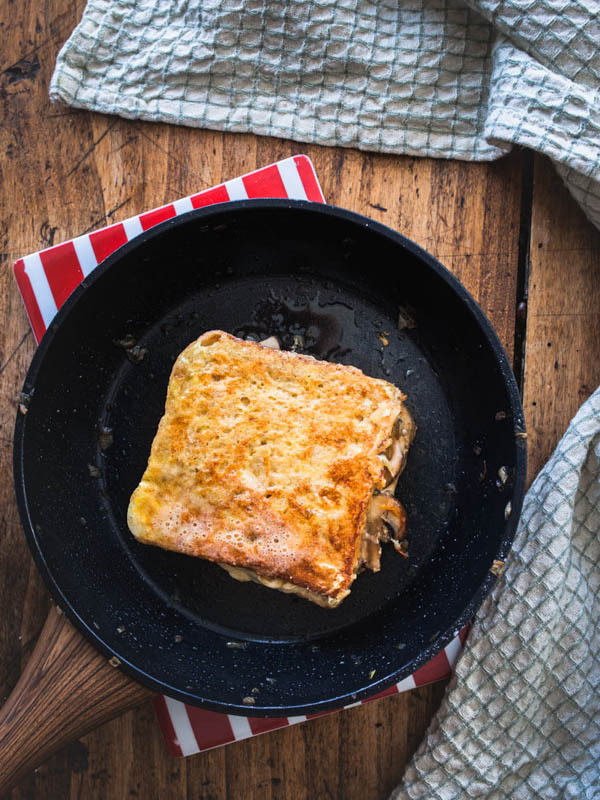 Today it’s getting crispy, savoury and umami with gooey, melted cheese and fried mushrooms. It started a couple of weeks ago that I discovered the beauty of a savoury breakfast. While I’m a sucker for porridge, granola, smoothie bowls and yogurt with fruits and feel happy and stuffed for hours my bf Grimm could start eating again just 10 minutes after our breakfast. As this is not acceptable for the (my) most important meal of the day I got my grey matter moving and brainstormed savoury breakfast ideas that would make both of us happy and full. Why isn’t a sweet breakfast as filling as a savoury one? That’s a good question and I don’t really have an answer to, but assumptions! Yay! It may very well be that we compose our sweet breakfast more towards the unhealthy side. Yogurt with lots of sugar, toast with nutella or croissants with butter and jam – instead of complex carbs there are lots of sugar, white flour and nothing really ‘substantial’ that’ll keep us full for longer than an hour. Yes, my porridge with lots of fruit, nuts and seeds doesn’t stuff my boyfriend either. So maybe the texture is another factor? Let’s be honest, ‘chewing’ a porridge isn’t really considered hard work for our stomachs – especially when we compare it to digesting a slice of whole-grain bread. In addition the that our brains might not feel properly stimulated either. If you think of smoothies or smoothie bowls, they are literally sliding through our digestive system without leaving a trace whatsoever. Is it simply a question of habit? I’ve been eating porridge for over a year on a regular basis and my body has adjusted to this kind of breakfast. It’s filling and satisfying. Grimm usually eats porridge every other day, when we eat together. In order to tackle my own habits we’ve started to have a savoury breakfast more often. 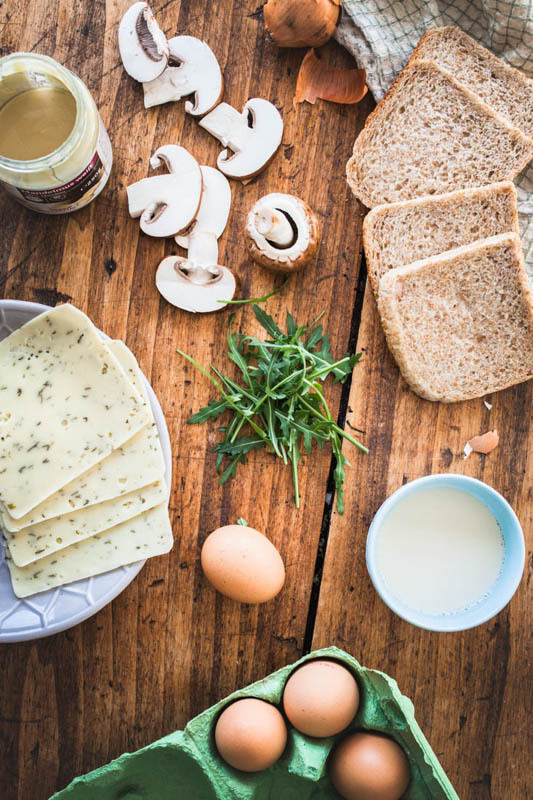 Depending on time, mood and the leftovers in the fridge this breakfast turns out simpler (plain bread with different spreads) or more pompous. After all I’m a food blogger and in the favourable situation of converting these escalating breakfast feasts into a blog post later. So stay tuned for more savory breakfast recipes in the future. And for all of you who ask themselves where to take the time for a warm, home cooked breakfast: I am a freelancer and neither in the furthest parallel universe would I get up before sunrise voluntarily. A good breakfast (or let’s stay realistic – a good brunch) is the luxury I treat myself with before starting my home office. For all those who don’t chose their work times freely I can only suggest to enjoy a long and relaxing Sunday breakfast with savoury French toast. No excuses, go to it! Clean and slice the mushrooms. Heat butter in a pan and fry the mushrooms for a couple of minutes. Season with salt and pepper. 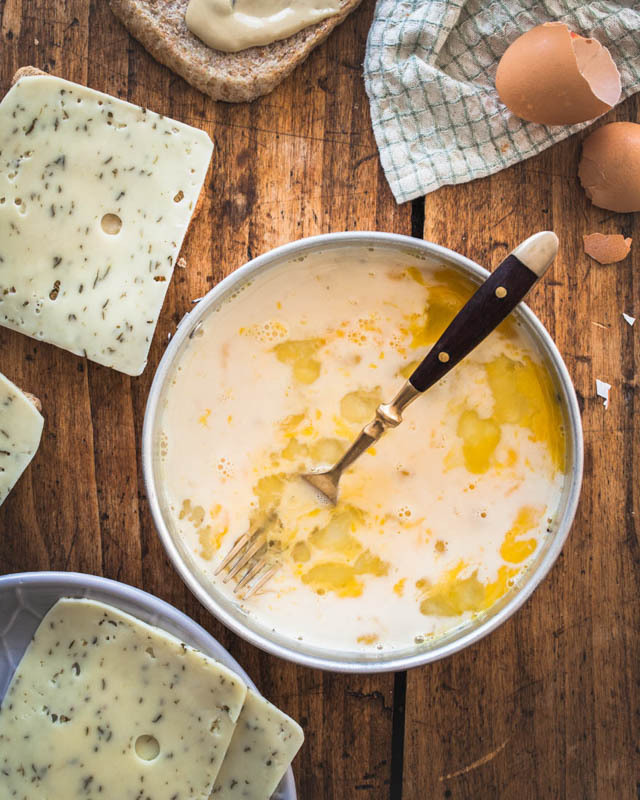 Crack the eggs and with the milk mix them in a soup plate (or the like). 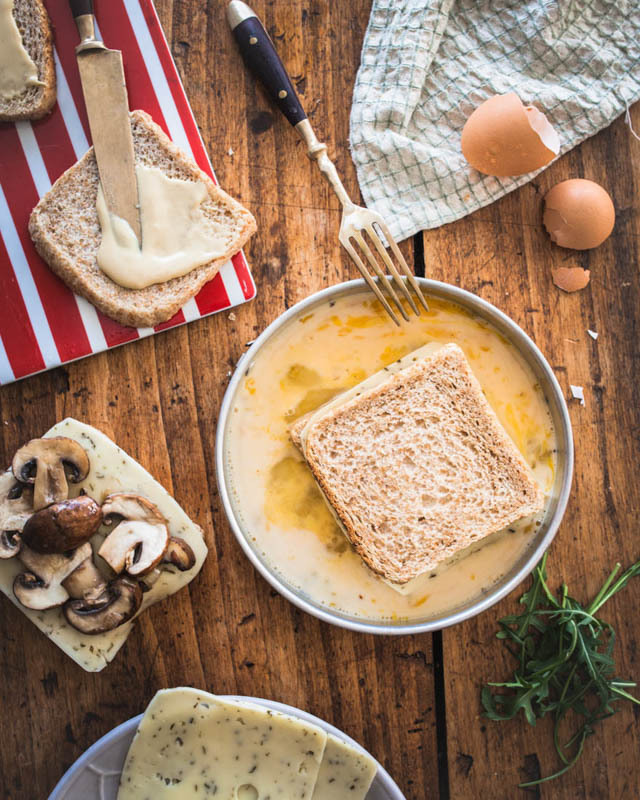 Spread cashew butter on 4 of the toast slices and add the cheese slices. 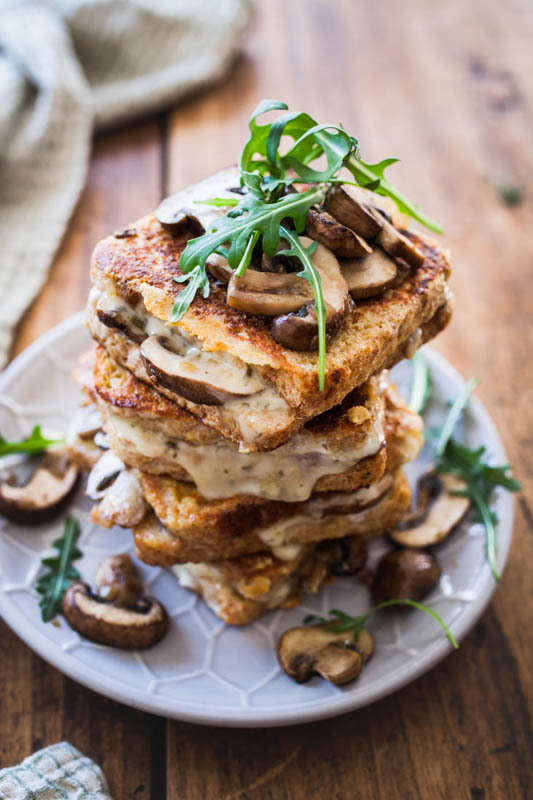 Spread the mushrooms evenly on top (you may leave some for the garnish) and cover them with the remaining toasts. Cover one sandwich after the other with the egg and milk mix from both sides. Heat butter in a pan and fry the French Toasts on medium heat (in order to not burn them) until crisp and golden. You can easily turn them over with a spatula and a spoon. 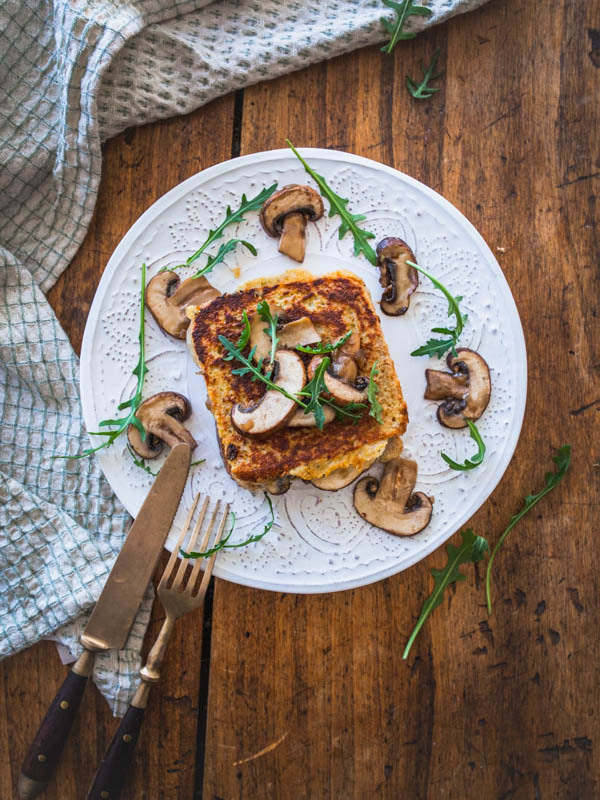 Garnish the savoury French toast with the leftover mushrooms and some rocket and serve when still warm.